This TI-5045 II followed the original TI-5045 and introduced a much sleeker design housing a two colour impact printer. 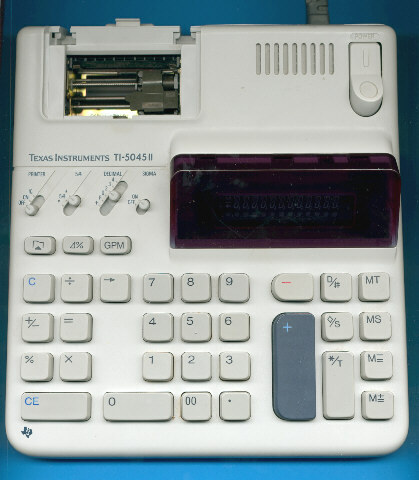 Within two years the design of the TI-5045 II was changed again. The internal construction of the TI-5045 II gives a clear layout with only few labour costs envolved. We know the Mitsubishi M58347P single-chip calculator circuit already from the TI-5035. The UL-File number E42662 of the calculator reveals it as a product manufactured by Toshiba TEC Corp. Don't miss the database of all known UL-File numbers found on Texas Instruments calculators. © Joerg Woerner, June 13, 2003. No reprints without written permission.